There is another Second Run sale on Arrow's site now, with several new titles added. Considering we only released 10 titles in 2016, for 4 of them to make the Little White Lies '20 Best Home Ents Releases of 2016' list is pretty gratifying!! Nice New Year prezzie - DVD Beaver's 'Best of 2016' poll is out, and Second Run titles take 2nd, 3rd and 10th places in the 'Top DVD releases of 2016' section!! Are titles #31, #47 and #67 still going to be released or will there always be these gaps in the collection where projects have fallen through? Any timetable for when the next set of catalog releases might make it to the Arrow store? Anocha Suwichakornpong's By the Time it Gets Dark screening at the ICA in a few days...pretty safe bet for a Second Run home video release (possibly even Blu-ray), maybe even a theatrical release? If all the above turns out to be right, that would be their second theatrical release, and also the second 'brand new' title to hit Blu-ray. Second Run Blu-rays ELECTRA, MY LOVE / SHOP ON THE HIGH STREET / MYSTERIOUS OBJECT AT NOON / MY 20TH CENTURY at just £13.99 on Amazon UK! SECOND RUN SALE AT ARROW STORE! In the next couple weeks the Arrow warehouse will be moving to a new location so we've decided to hold a sale to give you the chance to buy selected Second Run Blu-rays at £7.99 and DVDs at 4.99 !!! Excellent! Was actually bought a copy of The Shop on the High Street for my birthday a few weeks ago, but finally got My 20th Century (had been meaning to get it). Excellent prices...tempted by some of those DVD titles as well but there's a huge amount of stuff I want in the sale from Arrow Academy. I especially recommend Mysterious Object at Noon especially to anyone who hasn't got it yet! And The Fabulous Baron Munchausen on DVD for friends/family who might be interested (though the Blu-ray is clearly the way to go for those with an HD setup). Seems like all the Blu-rays sold out in hours. There's very limited stock on all lines - it's just what is being held at a particular warehouse. Once it's gone, it's gone. Just a few DVDs left in the Arrow Warehouse Sale at £4.99 - including JOSHUA OPPENHEIMER EARLY WORKS, MYSTERIOUS OBJECT AT NOON and Costa's HORSE MONEY. Absolutely delighted to find so many Second Run titles chosen among Sight & Sound magazine's 'Best Blu-rays and DVDs of 2017' poll! Our release of THE FABULOUS BARON MUNCHAUSEN seems to have been a particular favourite. For those keeping score, Baron Munchausen and along with Martin Scorsese’s World Cinema Project No. 2, is the highest ranked in that poll. Get on the Baron Munchausen train before others do. Yes, amazed and delighted to find THE FABULOUS BARON MUNCHAUSEN makes the top spot! And it's currently just £13.30 at Amazon UK and still in HMV's 2-for-£25 deal. (As is THE CREMATOR and WITCHHAMMER by the way. Just saying). 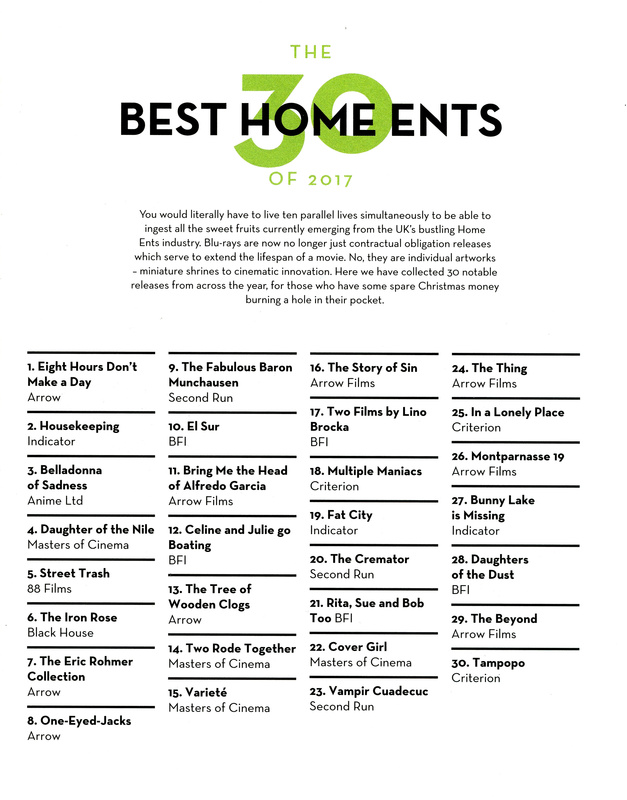 Little White Lies Magazine publish their top '30 Best Home Entertainment' Blu-ray and DVD releases of 2017. Delighted to find the Second Run releases VAMPIR CUADECUC, THE CREMATOR and THE FABULOUS BARON MUNCHAUSEN at #23, #20 and #9 respectively. I understand The Ear is out of print. Any plans to make it available gain? When I choose "Detailed List" while browsing the collection on Second Run's website, there's an entry at the bottom under "Forthcoming Releases" that details The Girl from Hunan (Xiangnu xiaoxiao) could be the next title after the upgrade for Diamonds of the Night (although the latter does not appear anywhere on the site and I'm still just going off of SR's facebook for it). You can vote for your favourite Second Run releases of the year (and a whole lot more) in the Criterion Forum BAFTAS: here. Is there any particular reason why Marketa Lazarova, and Valerie have not received Blu-ray upgrades yet? Last edited by eerik on Tue Nov 27, 2018 1:13 pm, edited 1 time in total. They're not upgrading Marketa Lazarová because it won't get past the BBFC uncut, and there are perfectly good alternative editions from the Czech National Film Archive and Criterion. Thanks, Michael. That's partly why I was asking. I'll just get the Criterion release then. A release of Juraj Herz's Beauty and the Beast is maybe on the horizon? Fingers crossed! It was restored for its German Blu-Ray release last year. I've not heard about any other restorations of Herz's films, but I'd be especially keen to see The Night Overtake Me (Zastihla Mě Noc) and an upgrade of Morgiana would always be welcome.